Decades of experience in designing, producing and installing our own system. Hiway srl was founded at the end of the 50’s as a factory manufacturing conveying systems for the automatic transportation and distribution of industrial granules and powders. By continued development in design and manufacture, both in laboratory and in real working conditions, Hiway have enlarged their activity in the main fields of the industrial sector. Many national and international awards that have rewarded our success. 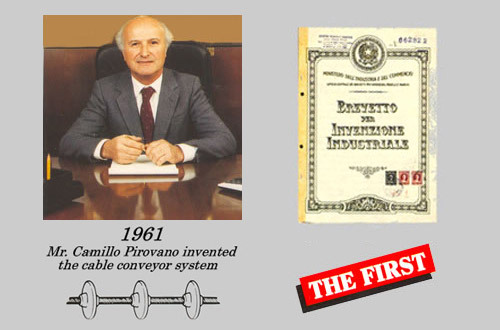 The historical patent shows how Mr Camillo Pirovano, C.E.O. of Hiway, invented the innovative cable system that consists of moulding plastic discs onto a steel cable, used to convey granules and powders, quickly and noiselessly, through a conveying tube. One revolutionary product that contributed to modern conveying systems and is still used today in many factories all over the world. Our inventions and products have marked all over the world the fundamental moments of evolution in the industrial sector. Our challenge for the future is a commitment to continue to share with all users of HIWAY equipment, a success that has lasted half a century. Hiway is leader in the field and is synonymous with high quality in a wide range of innovative systems for the handling of bulk materials and powders. Working with the most innovative computerised systems, the highly qualified and multilingual staff of Hiway are constantly available to offer immediate advice and solutions to their clients’ needs. We lab test any kind of product and carry out feasibility studies of the demanded systems, considering all issues and solutions according to the application scopes. Quality controls on products are continuous in observance of the provisions of the law and security parameters CE,ATEX etc., assuring complete compliance and reliability of the final product. Services include consulting, assembly, repairs, planned maintenance or immediate intervention to avoid any kind of inconvenience due to sudden failure, always assuring the best service. Absolute efficiency is possible due to a comprehensive warehouse full of self-manufactured spare parts. Hiway has a young and extremely dynamic assembly team able to supply technical assistance or staff training.